The name “Keystone,” doesn’t come from the city, or the beer but from ancient Roman architecture. 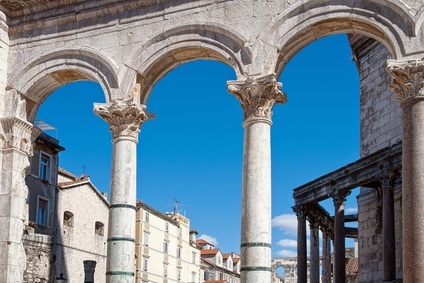 Arches were common place during the Roman Empire, however mortar was not used to hold these structures together. The arches relied upon the top stone or “keystone,” to hold the arch up and keep it from collapsing. And Keystone Dental Center can be the great Colorado Springs dentist that you need! Likewise, we are continuing to learn of the importance that a healthy mouth has on the whole body. We now know that periodontal (gum) problems can lead to increase risks for diabetes, heart disease, respiratory disease, possible stroke, pre-term births and low birth weights. These reasons are why we call our practice Keystone Dental Center, with Dr. Dan Lamb, a great Colorado Springs dentist. A healthy mouth is so important, and we want to do our very best to help restore your mouth to health, and provide you with the ability to maintain that health. We also know how important a beautiful smile is to your outlook on life. Simple things such as whitening can really brighten your smile and increase your self-esteem. We also offer other procedures such as tooth colored fillings and beautiful crowns and veneers if needed. We know what a significant difference a healthy and gorgeous smile can make, which is why we are dedicated to giving each of our patients the beautiful smile they deserve! Check out our website and learn about some of the techniques and technology that we use to provide our patients with the best dentistry has to offer, such as: CEREC (same day porcelain crowns), VELScope (oral cancer detection), digital x-rays (really reduces the amount of radiation exposure) and the many other things that we offer. CLICK HERE to contact us, make an online appointment or call us today at 719-596-0212!